DANGER DANGER – Screw It! I like Danger Danger, but their first two albums (the only I’ve yet to hear) are odd to me in that they are a bit too melodic and “light” to really be a part of the pop-metal scene, yet their lyrics would sometimes suggest otherwise (like the not so subtle but awesome “Slipped Her The Big One”). It’s like they wanted to go all out being a sleazy hair band, but they were just too melodic and AOR-ish to really get that dirty for a whole album. 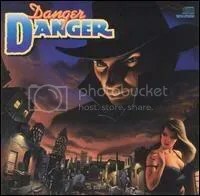 Not that it’s a bad thing, I like Danger Danger for what they are: a slick melodic rock band that is a bit of a guilty pleasure. If you don’t get caught up in the unapologetic “Slipped Her The Big One” or the Journey-like good time rocker “Crazy Nites” you just don’t know how to have fun! “Yeah, You Want It!” is a really puzzling rap-rock song about hair bands. I can only surmise the music itself was some type of parody of the Beastie Boys, right down to the Brooklyn accents. Overall, the album is just as enjoyable as their debut. I see this band get lumped into the glam and hair metal category alot, but to me, they’re a slick, keyboard-driven hard rock/pop act that has more in common with the AOR groups of the 70s than any of the glam acts of the 80s. “Naughty Naughty” was the band’s biggest hit and is certainly very hair metal (just read the lyrics! ), so maybe that’s why they got put into a category I personally don’t feel they belong in. Nonetheless, as slick and light as this album is, I really enjoy it. Ted Poley is a good vocalist and I’m actually surprised this band didn’t break bigger on the mainstream as the music here (well, besides “Naughty Naughty”…) could have easily found itself on a pop station at the time. “Don’t Walk Away”, “One Step from Paradise” and “Feels Like Love” could have made many a prom night for some young awkward 1980s couple… Or at least done well on the roller rink circuit during the “slow skates”. Honestly, this isn’t an album you can crank up too loud, it’s incredibly cheesy and dated, but it’s a great guilty pleasure.